Earth Defense Force 4.1: The Shadow of New Despair is an updated port of EDF 2025, which released on the PlayStation 3 back in 2013 to really poor reviews due to some major frame-rate issues. Now almost two years later we have 4.1, which looks to improve on the issues that plagued 2025 and give PS4 games a solid bug-killing adventure. In Earth Defense Force 4.1, you take on the role of four different classes in your fight against giant monsters who are out to destroy humanity. The four classes available are the Ranger, Wing Diver, Air Raider, and Fencer. Each class has their own specific use, like the Fencer who deals heavy damage but slow, or the Wing Diver, who flies around with a jet pack. The game features five different difficulty settings and over 89 missions that can all be played cooperatively online with three friends. When you do take the game online, whatever level you select is given a bit more depth to make it more fun for multiple players. The game also features a local split-screen option for those who want to play couch co-op. EDF 4.1 is a monster-killing-with-nothing-else-on-your-mind, shooter, and it doesn’t apologize for that. You will spend all of your time mowing down waves of enemy as you look to reclaim the maps you play. There is nothing fancy here, it’s just good old fashioned mass killing. The game offers you so many different weapons that you can use on your way to annihilating your enemies. If you’ve ever seen Starship Troopers and wanted to play a game just like it, well here you go. The PlayStation 4 has done wonders for the game, with environments, characters, and enemies looking really good. Sure, the worlds you fight in aren’t the most detailed, but that’s not such a bad thing here. The camera angles are actually set up really well in the game and I never seemed to have any issues finding my way in levels or fighting off waves of enemies. When I played Earth Defense Force 4.1, it reminded me a lot of the kind of fun I have with the Dynasty Warriors series except with guns. It’s extremely straightforward and at times, is the perfect stress reliever after a hard day’s work. 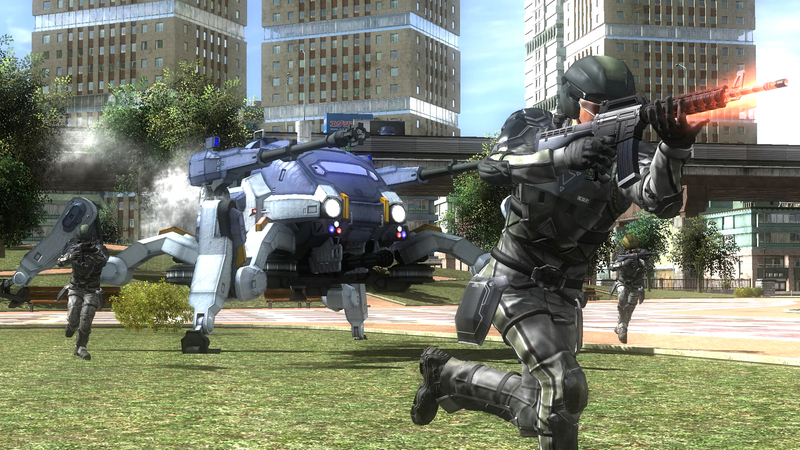 Earth Defense Force 4.1: The Shadow of New Despair releases on the PlayStation 4 later this year.